Welcome! Can you believe that it is Day 25 of the 30 Days of Christmas already? I hope you have taken the time this month to enjoy the holiday inspiration. Also, I hope you've had the opportunity to take advantage of the 20% discount on all Technique Junkies Christmas Stamps. All Christmas Stamps are 20% off until 11/13 by using the word Christmas as the coupon code at checkout. 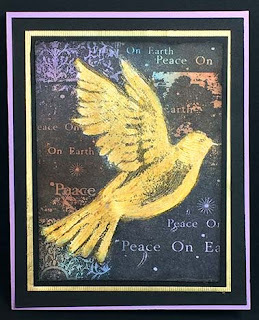 This card -- it is so beautiful in person -- is one of the Christmas cards I will be sending this year (I get bored making more than 20 at a time,so I make several designs a year!). The shimmer on this is incredible. 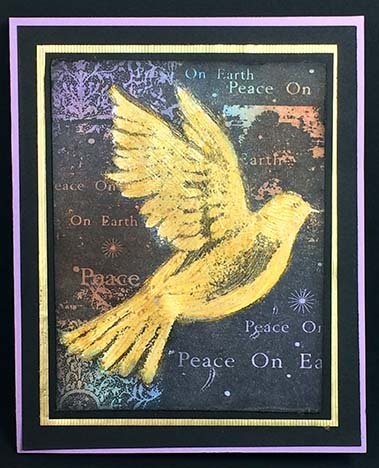 To create my dove, I stamped the Christmas Dove stamp on plain white cardstock using StazOn. I painted the dove with Vegas Gold Sorbet Paint from Art Anthology, and dried it with a heat tool (it only took 30 seconds or so to dry -- it is a very fast drying paint!). Then I sprayed over the painted piece with Wild Orchid, Juicy, Ink Spot and Peacock Feathers Art Anthology Colorations - none of which are considered Christmas Colors, I simply used a paper towel to pat off the dove, then let it dry and layered it onto the other cardstock pieces. This card took me less than 10 minutes to make! What I love most about this is that so many of you have purchased the Vegas Gold paint and Colorations from our booth at trade shows this year. How much fun is it to have another way to use the paints? I hope you are inspired by today's creations. Go create something!